CHARLIE Hughes is a man of many parts. 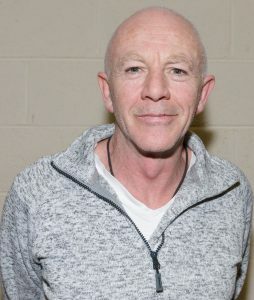 He’s the alarmingly-named Goo Eyes Delaney in Fair City and has played diverse characters ranging from Judas to James Joyce’s dad during a 20-year acting career. Now he’s taking on one of the most important roles of his life, as he embarks on his own project called ‘Happy Human’. The venture aims to help people build their confidence, overcome anxiety and become more positive in their work and everyday lives. A native of Athy, Charlie crossed the border into Laois in 2004 via Dallas and Boston and has become a central character in his adoptive home of Wolfhill, where he has just finished directing hit pantomime Sinbad and the pirate queens to packed audiences. In tandem with a busy acting career on stage and screen, he has done a lot of corporate and educational work over the past 15 years, mainly through confidence-building workshops for adults and teenagers in workplaces and schools. Charlie’s inspiration for ‘Happy Human’ came partly through his involvement with a Gaiety School of Acting programme called ‘Breathe’, which aims to improve and protect children’s mental health and to prevent young suicides. The venture brought him to schools across the country, as he delivered inspirational confidence-building drama workshops to teenagers. Charlie has adapted the idea behind ‘Breathe’ and added a variety of tools for his ‘Happy Human’ workshops, which can be tailored to individuals, schools, workplaces and groups of all kinds and sizes, from ten to 120 people or more. For Charlie, the most important tool in anyone’s toolkit for life is to believe in themselves, no matter what. Other effective and individually-tailored tools can be developed at a ‘Happy Human’ workshop, which typically lasts two hours. A talented sportsman who started working life as an electrician, Charlie followed his late sister Eithne to Dallas in the early 1980s, where he won a soccer scholarship and went on to become a professional footballer in Boston. In 1998, he won another scholarship, this time to the Gaiety School of Acting and thus began another action-packed and rewarding career. His proudest professional moment of the past two decades was the world premiere on stage of The Shawshank Redemption at the Gaiety Theatre in 2009, when he played “horrible prison guard” Entwhistle opposite no fewer than three Golden Globe winners – the late Reg E Cathey of The Wire fame, Kevin Anderson, who’s best-known for Sleeping with the Enemy and Keir Dullea, who played Dave in 2001: A Space Odyssey. It’s been a wonderful life so far. Now ‘Happy Human’ is opening another exciting chapter alongside Charlie’s ongoing acting and directing work. A website for the project is being developed and will go live shortly. In the meantime, Charlie can be contacted for bookings on 087 9591473.